Vision Bulakenyo…The Next Global City. 2018 GAWAD SINGKABAN AWARDEES. Governor Wilhelmino M. Sy-Alvarado together with Vice Gov. Daniel R. Fernando and Board Member Ma. Lourdes Posadas poses for a photo opportunity with the awardees of The Gawad Singkaban Awards 2018. From Left: Richard Cruz of Three Lucky Mountains Dragon Fruit Farm for ‘Best Agri-Tourism’, Ferdinand Talbenito, Jr. of Bistro Maloleño for ‘Best Restaurant’, Evangeline Buenaventura of Manejkom Travel and Tours for ‘BestTravel Agency’, Guiguinto Mayor Ambrosio Cruz, Jr. for their Halamanan Festival as ‘Best Community Development’, Guiguinto Tourism Officer Renato Villanueva as ‘Best Tourism Officer’, Maria Lynda Tubid as ‘Best Tour Guide’, and Ron Cabanjin of Klir Waterpark Resort and Hotels for ‘Best Hotel & Resort’ photo captured during the awards ceremony Gala held at The Pavilion in Hiyas ng Bulacan Convention Center, City of Malolos. 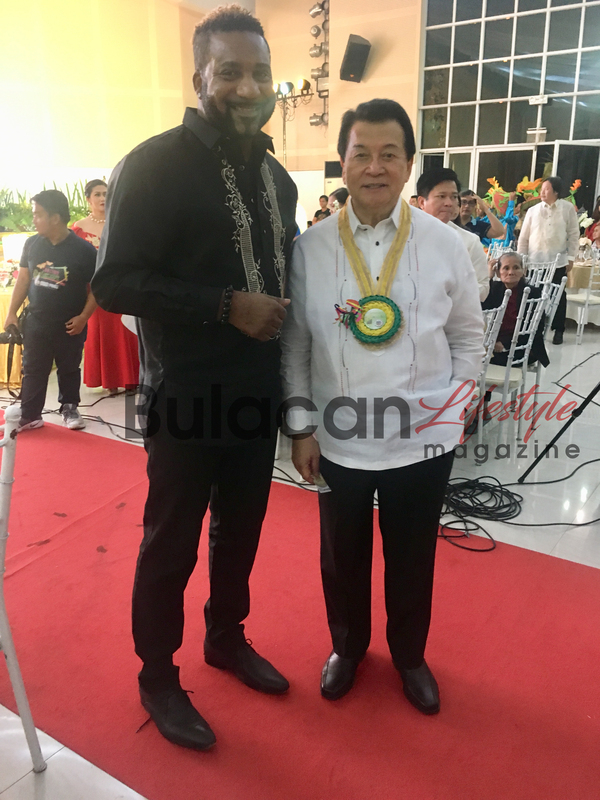 The 2018 Bulacan Singkaban Awards Gala was eye-opening. Held in Malolos City, Philippines, in the Capital Complex, at The Pavilion in Hiyas ng Bulacan Convention Center. The décor and cuisine was extraordinary; done by President of The Bulacan Suppliers Association, amazing premium quality catering was provided by HAPAG and award-winning special events coordinator, Malolos, Bulakenyo Gilbert De Jesus was also present, representing his Family Events & Affairs Company (FAES). Hosted by visionary, Honorable Governor Wilhelmino Sy-Alvarado and Honorable Vice Governor Daniel Fernando with Board Member, Lourdes “Baby” Posadas, Author of Gawad Singkaba Ordinance #276 T’17 & Bulacan Tourism, Arts & Culture Committee, Chairwoman, and fellow Board Member Allan Andan. The local star-studded event was a beacon for what’s to come from the Philippines fastest-emerging province, complete with local entertainers: singers, bands, entrepreneurs, festival troops, worship dancers -and the VIP Table Escorts were local Beauty Pageant Kings and Queens. As well as, live performances by Bulacan’s top 3 vocalists; Daniel Briones, Lara Lavinia Bayani and Jhon Harry Rodriguez, along with special guest performers Mary Justine Villanueva; who sang the lovely Bulacan Tourism Jungle, Melbelline Anne Caluag, Trixie Dayrit and the youngest kid singer, John Harry Rodriguez. Early signs of success and vast potential. The long-awaited potential in Bulacan is mind-boggling. The Governor Sy-Alvarado Vision, Futurists’ ambitious predictions, decade long growth-goals, along with the current expansion projects underway in the province, Bulacan is destined to rival its neighbor city: the high-cost, polluted and over-congested Manila, as well as, Quezon City. As a testament to the global awareness campaign underway by the Bulacan Province at-large, it was the first time The American Press Service (T.A.P.S.) was exclusively invited to attend the gala and; foreign media had the first opportunity to witness, and take notice of the vast-strides by the under-recognized province. US Media was present; represented by The Philippines Magazine International’s, US Executive Publisher, Kareem J. A. Jackson, accompanied by his Bulacan Lifestyle Magazine Editorial Director, Gabrielle R. Bautista and Assistant Editorial Director, Rosaly S. Ducut; styled by award-winning SWAG Barber Salon & Boutique Malolos City, SWAG PRO, Antonio “Rafa” Dela Cruz and a Trational Filipino Formal Barong Tagalog by Designer Michel Andre. After traveling, touring, showcasing and living in more than 300 cities, provinces and barangay neighborhoods throughout the Philippines on their undercover tours, The Award-Winning Philippines Magazine International deemed Bulacan as “The Best Province…” to live, work, invest and raise a family for expats, OFW’s and upwardly-mobile young Filipino professionals. Subsequently, The Philippines Magazine International, will be publishing a first-of-its-kind “Bulacan Lifestyle” limited special edition: the Philippines’ first complimentary province lifestyle magazine. The coffee table-style, magazinette is distributed internationally; in-print, on-line and digitally for free and will showcase true-Bulacan lifestyle. As well as, a Bulacan Lifestyle Business Directory; more than 500 Bulacan businesses, entrepreneurs, students, events, athletes, schools and politicians will be listed. More than 100 of the best businesses, entrepreneurs, media, farms, travel agencies, tour guides, tourism specialists, resorts, farms and agricultural sites were eligible and/or nominated for this year’s Sinkaban Awards. Representing Bulacan Entrepreneurship at its finest, ‘The Best of Bulacan’ and a large part of what fuels the massive-growth happening now in Bulacan. Bulacan-based Eco-Tourism, Festivals, Resorts and cuisine are among some of the most-popular attractions in the country. -Guiguinto Mayor, Ambrosio Cruz, Jr. recognized for the efforts of their town in establishing, The Halaman Festival. Publisher@ThePhilippinesMagazine.com and we will forward you to the proper department. The 2018 Bulacan Singkaban Awards Nominees and Award-Winners. Congratulations!